This is a photo of the outboard fence on my Casadei Shaper. My table top is threaded to receive these hex bolts which I can tighten where I want the fence to be. The problem I sometimes experience is when I tighten the hex bolt it causes the fence to shift sideways an 1/8" or so. Does anyone have a way to avoid this or a different method of attachment ? I am considering the Incra Mags that can be turned on and off but I'm not sure they would really lock the fence down enough to prevent ANY slippage. Your thoughts would be appreciated. Several things that might alleviate the movement when you tighten your bolts. Put a sleeve around the bolt that takes up the slack in the slot. Put a drop of oil under the head of each of the bolts so it will slide and not grab onto the washer. You also may want to use a C Clamp to hold the fence in position while you tighten the bolts down. Clamping the fence to the table surface before tightening the bolts is an excellent idea. If you can't do that then adding star washers under the flat washers will probably solve the problem. A really thick (like 1/4" thick) hardened washer or plate would be of great benefit. An ancient technique to prevent sliding was to put a couple grains of sand or salt in the joint before clamping. BUT, a much larger plate or washer should easily prevent the movement. The problem is the jig has developed memory due to the wear between the steel washer and aluminum plate so as it's tightened it wants to find the path of least resistance so it skates a bit. A large plate under the washer might do it, but a better solution might be a cam clamp. You may still need a larger washer do to the damage at the slot. Thank you for the input ! Does anyone think that a switchable magnet ( 235lbs of force with an on/off switch) might be a viable alternative? Maybe 3 of them along the fence ? Seems like it would save time and be more accurate but would it stay EXACTLY where I want it ? I've seen where some people apply non-skid tape to the magnets surface to prevent horizontal movement. Your thoughts? You have some solid suggestions, I would focus on those or look into rebuilding the fence so it can be bolted to the table in a way that the fence can be repositioned easily and locked down separately. There’s many different ways to accomplish this from threaded rod to kipp levers in slots. I use magnets all the time positioning steel for welding and even my 400lb magnets don’t resist a lot of lateral force. Will three work? Maybe, I have my doubts. Depends on the amount of lateral force and the strength of the magnets, 235lb magnets aren’t that strong. Thinking more about this if you don't mind drilling the existing fence fixture and table surface then drill a couple 1/4" index holes straight through both. Then insert a fixed 1/4" pin in the bottom of the fence fixture and drop them into the table surface index holes. 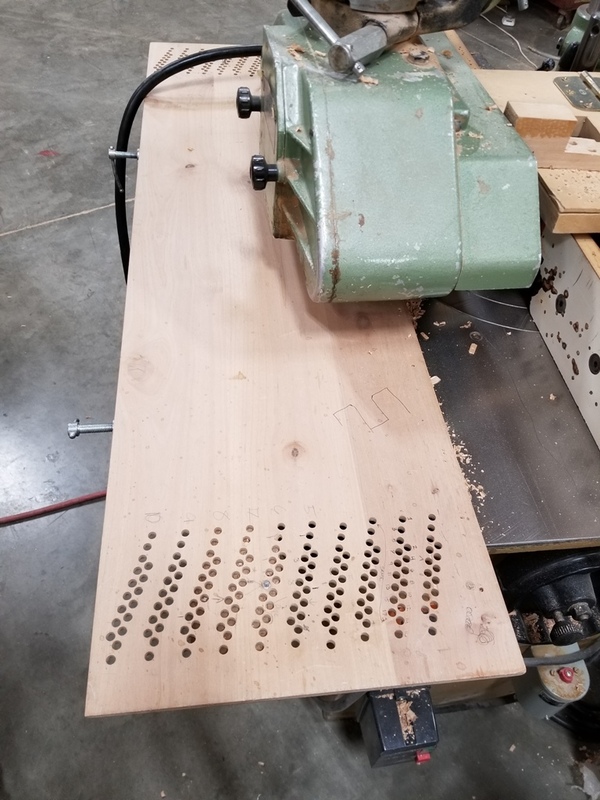 If there are existing holes in the table surface, and you have access from the bottom, you can drill up through them and then into the bottom of the fence fixture. That way you won't need to add any more holes to your table surface. You'll just need to size the indexing pins accordingly. Switch to flat head allen cap screws. They self align because of the taper. You could have a machine shop put your fence on a bridgeport milling machine and run a tapered cutter down your slots. I use them to self center jigs on the shaper table. Our tenoning jig has a couple that fasten it to the sliding table. Its accurate enough that I rarely have to square the tenoning fence. We use them on the W&H to center the cutters. I like B H Davis' suggestion so far with the fixed alignment pins. In my experience, the magnets are OK, but will slide sideways. The "force" in so many pounds is withdrawl, not shear. There were some photos and descriptions a while ago here on Woodweb of an outfeed set up that had a dial indicator and threaded rod to set for different cuts. Well thought out, I think this was the 3rd iteration of the jig. I find that I have to make a complex jig about 2-3 times to get it right. I would take a look at how they do table work on things like a Bridgeport milling machine. If you have a customer washer made in the shape of a T. The hole could be drilled line on line with bolt. Its more like a t-slot gib upside down. The t washer could be an inch long. I just bought a 3" X 3" square washer to go under each machine bolt as suggested above. No more slippage ! Thank you everyone for the replies. There does seem to be a need for an outboard fence system built more stout than the Aigner and hopefully a bit more inexpensive. Happy New Year to all my fellow craftsmen ! Dont use washers. use a bar that goes from one bolt across to the other. Let me introduce you to the "holy jig", or is it holey? Not sure but works slick, quick adjustment, 1/32" increments. No bolts or washers, just a couple of 1/4" studs, and really cheap!! Please forward royalty checks accordingly. AM, nice simple setup. Did you CNC the holes? I noticed the broken plastic handle on the drum switch, Typical. I finally made an aluminum one. Yes cut on the cnc. I had drawn this up well over ten years ago and finally cut one out about a year and half ago to "test". There it still is and the guys love it. Out of aluminum or even acrylic would be slick. And yes broken drum switch! It's amazing in a shop environment what damage can be down. I love the holy fence. Would you consider sharing you design file? Give this a look. I think I've got about $600 in parts, and a bunch of hours scratching my head on how to make it work.